Rihanna posted photos of herself in costume to Instagram on Kadooment Day. 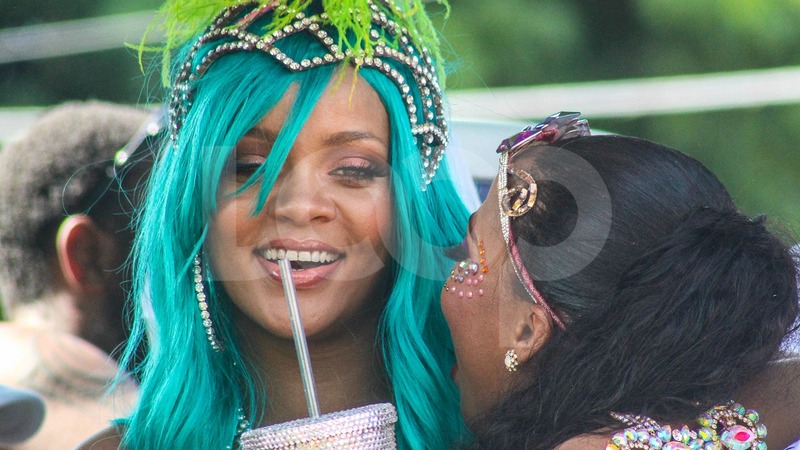 Rihanna lit up Instagram when she posted photos in costume on Kadooment Day. The sparkly creation was custom-designed and made by Lauren Austin, designer for the Aura Experience band, who spoke with Vogue writer, Brooke Bobb, on the making of the unique design in an exclusive interview, entitled 'The Story Behind Rihanna's Wild Crop Over Costume'. She told Vogue Rihanna selected the design from among several she proposed to her and Rihanna, not surprisingly, went for the most daring design. The costume combined bright, playful colours such as yellow, pink, green, turquoise and silver. The massive feather backpack spread out behind her like a peacock's tail, providing the perfect backdrop for Rihanna and her glitzy two-piece costume, covered in iridescent crystals, to shine. Her styling was on point - from her bright blue nails to her flowing, shoulder-length turquoise hair that complemented the design perfectly and made her stand out even more among the sea of feathers and jewels that are everywhere on Kadooment Day. Elaborate hand and leg accessories,bedazzled tights and a tall headpiece with crystals and feathers completed the look.